Home » MEG Brain Imaging » What Will MEG Tell Us About the Ready Mind? What Will MEG Tell Us About the Ready Mind? Magnetoencephalography (MEG) is a completely safe and quiet brain-imaging device that is appropriate for the youngest children. It acts like a large stethoscope or sensor for the mind. MEG allows us to examine the whole brain in action while a child experiences a word, sight, emotion, or touch. MEG technology will reveal the magic of early learning and why what we learn early is so potent and durable in memory. The exquisitely sensitive MEG brain-imaging device can map the mental activity of an infant only a few days old and proves that the mysterious little brains of children are anything but empty. In fact, those brains are often busier processing data than the brains of adults. I-LABS studies show newborns can hear the subtle distinctions between sounds used in all the languages of the world – a feat no adult can achieve – and that between ages 0–7 children have a much greater capacity to master foreign languages than their parents. “Understanding why children easily learn a second language while their parents struggle requires a kind of rocket science for the mind, and our new MEG will allow us to do it,” says Institute Co-Director Patricia Kuhl, a world authority on early language development. “This could lead to second language learning programs that work for people of all ages,” adds Kuhl. There are very few MEG machines in the United States and no other laboratory has developed MEG measures for infants and young children. 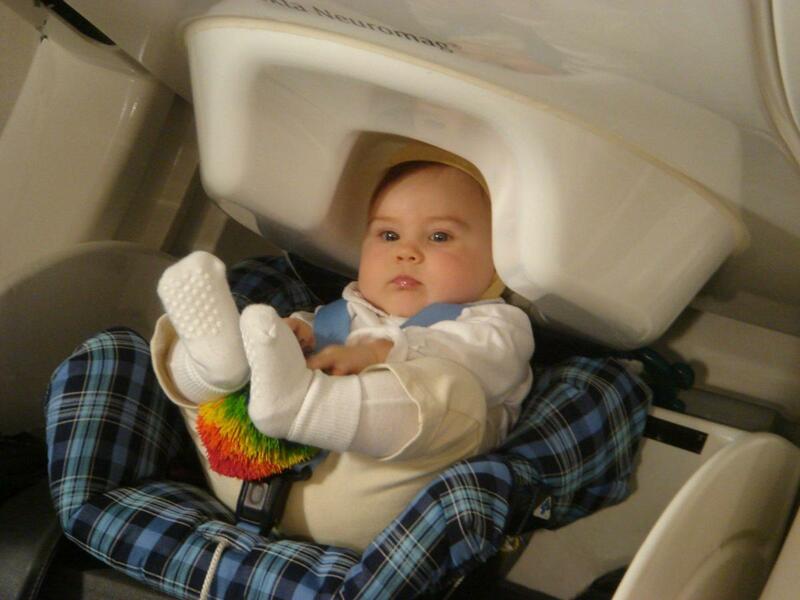 In 2006, using a MEG machine in Helsinki, Kuhl and I-LABS faculty member Toshisaki Imada were the first in the world to record brain activity in awake infants as they listened to various languages in the MEG machine. With I-LABS’ newly funded MEG, the researchers can finally pursue their goal of creating the first brain-imaging center focused on children, right here on the University of Washington campus. Like early explorers mapping unknown continents, pioneering researchers at the Institute will be able to plot the uncharted territory of a child’s developing brain, studying critical neural connections that make up human intelligence. MEG, completely safe and quiet, acts like a large stethoscope or sensor for the mind. A child sits under the machine, which resembles a large beauty-parlor hair dryer. When he or she experiences a word, a sight, an emotion, or a touch on the hand, the neurons working together in the child’s brain generate tiny magnetic fields. MEG technology pinpoints those fields and tracks them millisecond by millisecond, with millimeter spatial precision, creating topographic-like maps of the brain. These MEG maps could transform parenting, education, healthcare, child welfare and juvenile justice systems by leading to tools that identify children with disabilities at early stages, when intervention is most likely to succeed. That could mean detecting problems before babies ever speak their first words. It could mean screening infants who are at risk for autism as young as 15 weeks of age. Bringing this leading-edge technology to the UW seemed an impossible dream. The I-LABS Advisory Board and donor community encouraged the researchers to ‘think big’ and set priorities based on scientific and societal importance, not cost. MEG was at the top of the list. With strong support from the University of Washington, I-LABS scientists were able to secure a $4 million grant from the Washington State Life Sciences Discovery Fund to purchase the MEG and renovate I-LABS’ space to create the new MEG facility. The MEG facility will explore not only the minds of children and the magic of early learning, but also can be used to study the neural activity of people at any age. Studying brains and learning over a lifespan will lead to improved diagnosis and treatment as well as improvements in ‘neural exercises’ designed to help keep the aging brain cognitively sharp.